After coffee* and I had to break up this summer, I decided to try green smoothies a few mornings a week to see if they would give me energy while not hurting my belly. I started out with smoothies from a wonderful booth at a local farmers' market and was loving it! I decided to buy a Ninja blender when they were on sale on Zulily**, and while I was waiting for it to arrive, I tried store bought versions from Odwalla and Naked Juice. And this was when I learned that a lot of green smoothies you purchase have garlic in them. What? Who would have ever thought that juice and garlic went together? I'm allergic to garlic, so my tummy and I were not so much happy and I wondered why I'd ever started this green smoothie adventure. Then I realized the garlic issue and found one without from Odwalla and I was happy again. Ellie has been on this adventure with me and LOVES green juice and green smoothies. We have a new morning ritual where she cuddles with me for a few minutes and then we both get up and head to the kitchen. We drink our green smoothies, and she has a little breakfast while we chat and I make her lunch. It is usually pretty awesome with little whining or arguing and mostly chatting and giggling. And she knows what's going in her lunch, which makes her more likely to eat it. And I'm getting a green smoothie into her to give her energy for the day! Last week the Ninja arrived and we started making our own smoothies. I follow Simple Green Smoothies on Instagram after seeing Jadah's talk at WDS this summer, so I already had a few ideas about what I'd be putting in the smoothies. And I knew to use their suggestion of putting the greens in with the liquid you're using to get the leaves juiced before adding anything else + adding in some frozen fruit if you want the smoothie to be cold. 1 cup spinach + 1 cup water. Blend. Then 1 cup frozen strawberries + 2 pears + 1 apple. Blend. :: Pictured at the top of this post. A happy green color! And very yummy. Ellie loved it BUT wouldn't drink the whole glass because I kept the skin on the apples. Good to learn! 1 cup spinach + 1 cup water. Blend. Then 1 cup(ish) pineapple + 1 cup(ish) frozen strawberries. Blend. :: So this was not quite right for EJ and me. It went into the fridge to "rest." As I wrote on Instagram, "If it were a soup, I'd say it needed more flavor." After some awesome Instagram suggestions, later in the day I added: a banana, frozen blueberries, and a bit of agave. I probably didn't need the agave with the blueberries. And I actually think agave alone would have been enough to sweeten up the first attempt. But now I had this gorgeous purple! color shown below to drink up while in the carpool line at Ellie's school. She took over my glass as soon as she saw the purple and drank up the rest while on the drive home. Yesterday for lunch I had this one: 2 big leaves kale (off the stem) + 1c water. Blend. Then 1 purple carrot + 1 banana + small handful frozen blueberries and strawberries. Blend. :: This one was so good and of course purple! (My protein was a side of sharp white cheddar. Almost like wine and cheese. Almost.) I had enough to save to drink this morning but it was super pulpy and the carrot taste was very strong. To save it, I'll probably add some of Ellie's apple juice just to even out the taste a bit. Next up is getting some protein added in to our smoothies. One thing I love about FB and Instagram is when you start something new like this, people are full of suggestions. Thank you! So I've added protein powder, almond butter, and a few different types of seeds to our lists of things to try when I get back from Fill It Up Buttercup (my retreat that starts Wednesday). 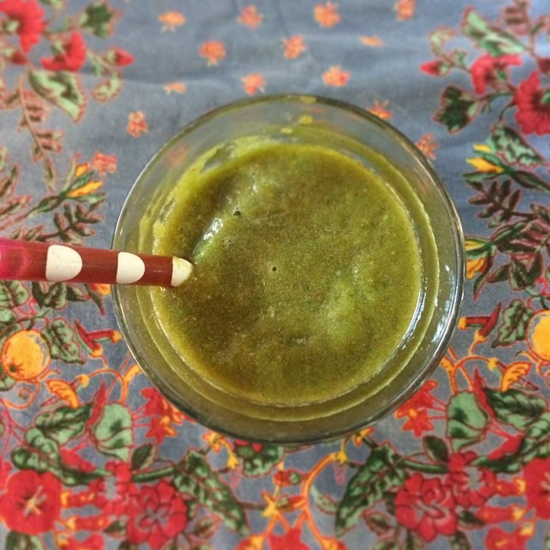 And I'm going to keep sharing my #greensmoothieadventure over on Instagram. Love sharing and learning from you. What are your favorite green smoothie concoctions? *When we were at Harbor Greens shopping for our smoothie ingredients, I spotted cold brew coffee in the refrigerated section. I'd heard it was quite a bit less acidic then regular coffee. So I tried it. And oh my gosh it didn't hurt my stomach. I'm looking forward to trying it again + brewing my own to bring coffee back into my life from time to time. I've even read that you can add it to hot water to drink it hot. I'll report back about those adventures too. **This Zulily link is an affiliate link. If you sign up for Zulily through it, I get a small credit when you purchase your first item. Zulily is one of my favorite companies because their customer service is over-the-top fantastic. If you want to be notified the next time Ninja blenders are on sale, sign up, then search for Ninja, and then favorite it. They will send you a heads up the day before they go on sale. Mine was $50 less than the Amazon price. I know I sound like a commercial here, but I really do love this darn blender + a sale is a very good thing for something you'll use all the time.